The landscape of childhood has changed. Those of us fortunate enough to grow up raised by the glow of the TV set on Saturday Mornings as we watched our favorite cartoon characters – must never forget those wonderful times. Saturday morning was our time. Our time to grab our favorite bowl of cereal and sit quietly as we watched – suspending our disbelief even if it were for just a few hours. We must remember those days of old. We must reach down and recount the many stories that made us laugh and cry. We owe it to this new generation. The Arsenal of Artists has gathered once again. We will raise our voices and recall our memories leaving no Toon behind! Playful Gorilla and Cash Cannon Proudly Presents The Arsenal of Artists “No Toon Left Behind!” A group art tribute show remembering Saturday morning cartoons. 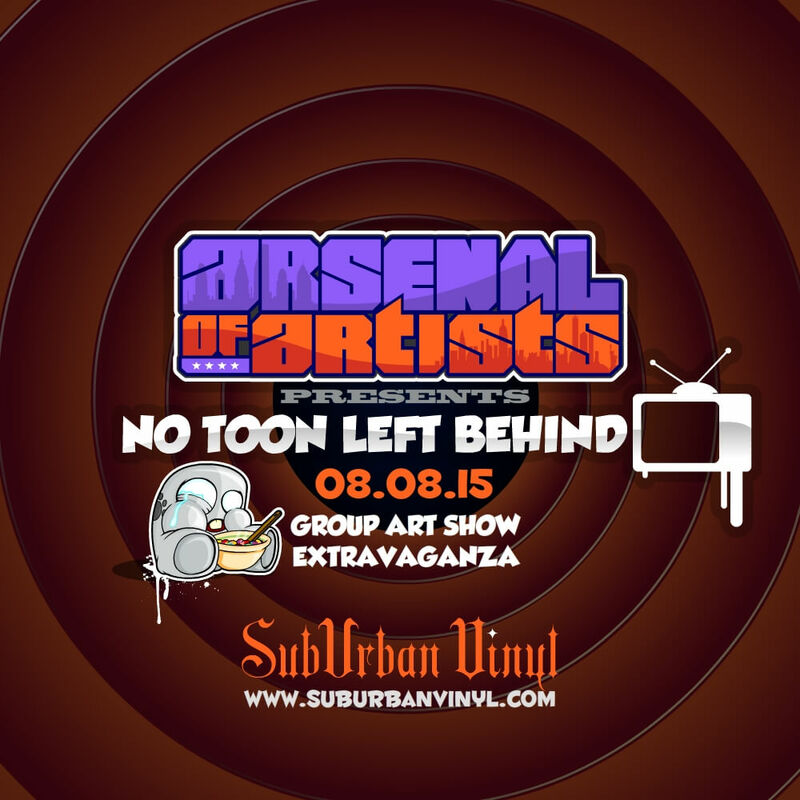 The Arsenal of Artists follow up show will once again take place at the Suburban Vinyl Art Gallery in Waldwick NJ on August 15th, 2015 between 4pm – 9pm. “No Toon Left Behind” will feature 70+ unbelievably talented artists ranging from toy artists to customizers, from digital illustrators to 3d artists. Each participating artist will bring original artwork with a cartoony twist throwing back to their favorite childhood memories. Come support this amazing line up as we throw a BBQ party with door prizes, raffles, free food, drinks and guaranteed great times! And always remember… after these messages… we’ll be riiight back!